No matter what time of year, ice cream is a favorite snack for Coloradans. From the creamiest gelato, all-natural ice cream, frozen vegan options, soft-serve or a completely unique flavor, Colorado has an ice cream parlor to serve your needs. Find your next favorite treat at these 10 best ice cream parlors in Colorado! 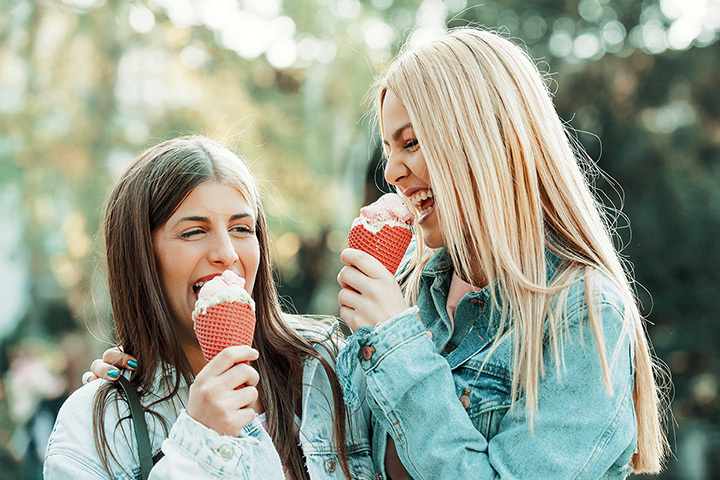 Choose from nine classic flavors of ice cream or venture into the 11 rotating flavors, such as Trix cereal or bourbon corn flake, at Sweet Cow Ice Cream. This decadent ice cream can be found in now numerous locations, along with the ice cream truck that travels to events around the Front Range. If an ice cream cone isn’t your thing, get the most perfectly made root beer float from root beer on tap. Or try one of the ice cream sandwiches; you’ll definitely be back to Sweet Cow after one of those addicting treats. Sweet Action Ice Cream has become one of the best ice cream parlors in Colorado by using local ingredients and fresh Colorado dairy. Vegans can also even find a sweet and cold snack at Sweet Action. Your favorite flavors can be found here along with some surprising concoctions, such as ginger, Thai ice tea or strawberry balsamic. Flavors change often so you never know what newest or weirdest favorite flavor will be next. Bonnie Brae Ice Cream has been serving ice cream made in-house since 1986. With over 50 different flavors, there is no surprise why Bonnie Brae is a popular favorite. Get unique flavors or just plain vanilla in a cone, sundae or a decadent milkshake. With flavors like banana cream pie, English toffee or apple pie, Bonnie Brae is your go-to parlor for a wacky yet delicious cold treat. Find fresh ingredients in these hand-mixed ice creams by Glacier Homemade Ice Cream & Gelato. Real ingredients go into the ice cream here. Freshly-squeezed lemons and limes are the not-so-secret ingredients in Glacier’s citrus flavors. Since opening in 2001, more than 1,000 flavors have been created at this ice cream parlor. With choices among ice cream, gelato and sorbet, Glacier seems to have it all, no matter what you’re craving. Try the chocolate mousse or even Nutella gelato, or ice cream flavors such as spicy chai or Junior Mint. Don’t forget to top all flavors with made-in-house hot chocolate. This family-owned ice cream parlor has been offering customers some of the best ice cream around since 1976. Different flavors are rotated out daily, so every time you walk into this Capitol Hill establishment you will find something new. Liks has created over 400 different flavors since opening decades ago. Try a scoop of Jack Daniel's, chocolate chip, PB&J, or even cayenne caramel. This milk jug-shaped shop features fresh and delectable ice cream in Denver. Known as the “home of the salted Oreo,” Little Man Ice Cream has a variety of rotating flavors of ice cream, gelato and sorbet, but the salted Oreo is worth the wait in line. There are usually around 60 flavors to choose from with unique flavors like Bhakti chai or peach cobbler. Josh and John’s has made a name for itself in Colorado Springs by having creamy and flavorful ice creams. This ice cream parlor churns its ice creams slowly to ensure the fullest flavor. The local favorites are Almond Joy and the Mocha Java Jolt. High Point Creamery serves 18 flavors with a mix of old school classics and new age creams, such as blackberry basil or Earl Grey. A good old scoop of ice cream is definitely satisfying, however if you are interested in something different, try the French-style ice cream cake, bombe. Go to Rizuto’s for a fair priced ice cream that is also absolutely delicious. The huge menu of ice cream, gelato and even self-serve ice cream has made Rizuto’s a popular ice cream parlor in Colorado Springs. Do expect a line some days but that just gives you more time to decide on the over 40,000 flavor combinations of ice creams and treats. This family-owned ice cream parlor in Denver makes ice cream in-house on a daily basis. Nuggs offers some delicious, all-natural ice cream options that are even made with real fruit. Try all the free samples you want before deciding on an ice cream in a waffle cone or even a shake or sundae.